KAISERSLAUTERN, Germany - Thousands of Soldiers and pieces of military equipment will move across Europe by train, convoy and barge this summer in support Strong Europe operations, exercises and the rotation of regionally aligned armor and aviation brigades. 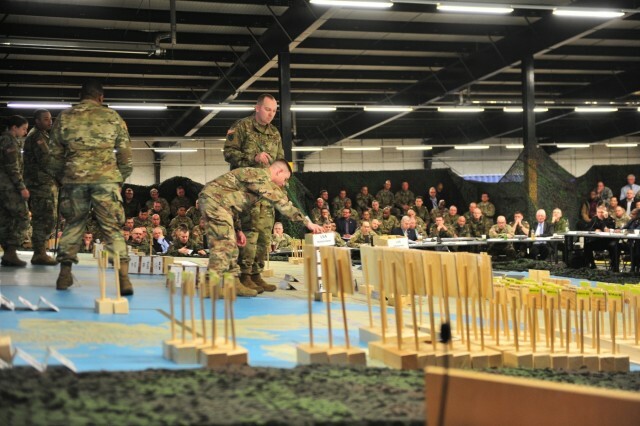 In preparation for these complex moves, military and civilian leaders across Europe came together at Rhine Ordnance Barracks, Germany, March 15-16 to plan and synchronize the various shifting pieces. The meeting, called a "rehearsal of concept" drill, brought key stakeholders together to discuss how to transport equipment, feed and move personnel, and provide other support around Europe. "These ROC drills are really important," said Col. Michelle Donahue, commander, 16th Sustainment Brigade. "They provide shared awareness and shared understanding among all the participants for the (U.S. Army Europe) exercises, but it also builds trust between the supporting and supported units. In addition to that it also provides us an opportunity to have an open dialogue about any of the friction points." 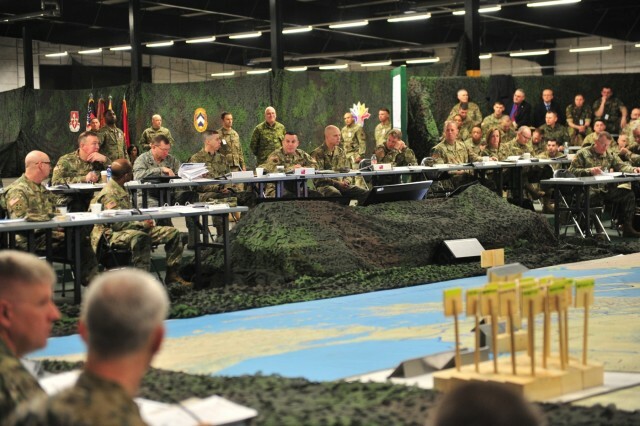 With a series of exercises planned from now through September and beyond, plus the simultaneous rotation of forces in and out of Europe in support of Atlantic Resolve, leaders said it is important to plan ahead to avoid conflicts and delays. "It is a very challenging operation especially with the amount of forces moving in our area," said German Brig. Gen. Rolf Wagner, deputy supply officer for support, NATO Multinational Corps Northeast, based out of Szczecin, Poland. "This has to be pre-planned and pre-organized in a very detailed way, and that is done here in this planning conference." Personnel from the Polish, German, Lithuanian, Canadian and other partner and ally nation armies attended the two-day event. Commercial entities, such as German railway company Deutsche Bahn and cargo shipping company American Roll-on, Roll-off Carrier, also had representatives at the conference to contribute to the discussion and to build a common understanding of the requirements and mission. "Working with our allies is critical," said Maj. Gen. Steven Shapiro, commanding general, 21st Theater Sustainment Command. "There is no way we are doing this alone. For exercises we are not doing it alone, and if we have to do this for real we are not doing this alone. We are doing this as part of an alliance." The ROC drill allowed those who attended to focus on how to support the missions to deter aggression and assure allies in Europe. This year 1st Air Cavalry Brigade will be replaced by 4th Combat Aviation Brigade, and 1st Armored Brigade Combat Team, 1st Cavalry Division will replace 2nd Armored Brigade Combat Team, 1st Infantry Division in support of Atlantic resolve. Units from 82nd Airborne Division, the U.S. Marine Corps, as well as units from other nations will be supported during annual exercises like Swift Response and Saber Strike. "Power projection is what makes our Army special, what makes our Department of Defense special," said Maj. Gen. Steve Farmen, commanding general, Surface Deployment and Distribution Command. "Nobody else in the world has a transportation command that can project like we do. "Our job is to be that connective tissue, be adaptable, have agility and be able to flex where we need to in order to meet the commander's intent," Farmen added. 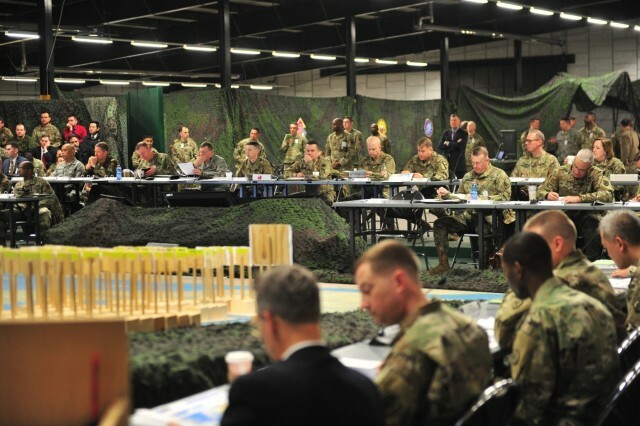 The detailed planning and preparation will allow Soldiers to make sure equipment and supplies are reaching their destinations at the right time and without conflict as units move from areas as wide ranging as Belgium to the Baltics and down into Romania and Turkey this summer.